Recently, Bryant left a comment saying, "I was wondering if you girls could do a forum kind of a thing, with a discussion question like views and preferences on makeup, nail-polish,and such. You could each give your thoughts on it, and then open it up for girls to give theirs. Just an idea. :) I'd really like to hear your views on makeup and such." I (Anna) had been thinking about posting about such things for quite some time, so with her encouragement we decided to do it! Also, the format, as more of a forum discussion, is a little easier to write. So, we'll state a topic, and Miriam and I will each give our opinion of it. In the comment section, we would enjoy hearing your thoughts as well! Please keep in mind that our answers are not laid-down rules that everyone should follow. They just reflect our thoughts and experiences. To make things easier and shorter, we will do a series of posts, one for each topic, like makeup, nail polish, hair, jewelery, and whatever else we think of. Let us know if you think of something you'd like to see discussed! Right now, I don't wear makeup if I can help it. :-) It's not because I hate it or think it's awfully bad - it's mainly because I don't want to take the time to put it on each day. For dance recitals and theatrical things where I'll be under bright lights, I do put some on to help my face not get washed out, and sometimes I wear it to dress up and take pictures with friends. Even then, I try not to overdo it. Other than those times, except for a little lip gloss once-in-a-while, I rarely wear makeup. It's just too much of a hassle, in my opinion! I think girls need to realize that makeup is not what makes them pretty. When I was younger, my parents didn't allow me to wear makeup, so I didn't have to decide whether or not I was going to - I just knew I couldn't! As I grew older and mom told me I could start wearing it if I wanted to, I found that I really didn't want to. Not only did I not want to take the time to put it on each day, I also had seen the experiences of many other girls, and didn't want to find my beauty in powder and paint. A girl explained to me once how she started wearing makeup all the time: "At first I wore it only on special occasions, then to church every Sunday, and then I couldn't stand seeing myself without it on!" Though I feel pretty and special with makeup on, I want people to see my true self, my real face, even if it's not as beautiful or perfect as the next girl's. It's who I am. In the TV series "Frontier House" (which I don't necessarily recommend), three families took the challenge of living exactly like people did on the prairie in the 1800s for a time while their experiences were documented. As the women and teenage girls fretted about having to give up makeup for 3 months and appear on TV without it, one of the dad made a good observation (and I roughly quote): "In times past, women covered up there bodies and let their faces show. Nowadays, women cover up their face and expose their bodies." I like the former way much better. Another plus of not wearing it is that it's healthier for your face not to have something on it all the time. Makeup will sometime clog pores and cause acne to break out. A clean face with the love of Christ shining through your eyes will cause you to look lovely! Inner beauty is of much more importance than outer beauty. Do I think it's bad to wear makeup? No, but you should examine your motivation. If you can't bear to see yourself without it and think you're only pretty with it on, you should probably step back and reevaluate your priorities. God made each woman beautiful in her own way, and you should be afraid to let your true face shine forth! Does that mean I'll never wear makeup? I don't know what the future holds, but I don't plan on wearing it on a regular basis anytime soon. If you do wear it, always remember that moderation and simplicity is usually better then extravagance! 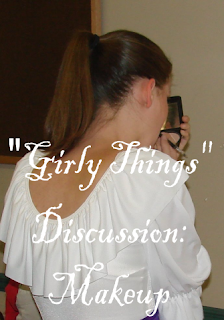 When I was younger, all thoughts of anything girly pretty much didn't enter my mind. I was outside almost all the time and I was pretty much a tomboy. But, the inclination was still there. The desire to dress nicely for occasions and church on Sundays eventually turned into sometimes painting my nails (though I still do that very rarely) and actually wanting to fix my hair nicely (something I didn't care about for the longest). When I turned 14, Mother said that I could start wearing makeup if I wanted to, but I hated the stuff! =) I did start wearing it for concerts, but still protested the mascara, which was a little necessary for my short eyelashes. Now, I wear makeup occasionally. By makeup, I mean face powder, blush, and sometimes mascara. I usually only wear face powder if my face has broken out, then I use it as a cover up. But I never have liked the idea of wearing a lot of color on my face. It seems so unreal and I have always enjoyed just being me. Now, would you please share? Do you wear it or do you not? What are your reasons for wearing/not wearing it? My thoughts are pretty much the same as y'all's. I don't wear it if I can help it. If I'm going to be performing or under a lot of bright lights I do wear a little powder to keep from shining. ;) I'll also occasionally wear a little lip stick, but not often. I just don't care for all the worry that comes along with make up; I don't like thinking about whether it's worn off or if it's on my clothes, etc. It's too much of a hassle for me! I usually do wear makeup, but I don't like wearing a lot or taking long to put it on. I'll usually wear some powder to even out my skin, a touch of blush, a little bit of brown liner, and maybe a little eye shadow. I don't like to be able to feel my makeup...if it doesn't look and feel fairly natural, then it's too much for me. I think one reason for this is I want to still look like me and I also don't want to get to the point where I feel naked without makeup. It does feel nice to look my best though! P.S I like the idea of a forum type thing! Thanks! I think makeup should be used to enhance a woman's beauty, not make her beauty. My personal thought is if someone you've never met before can tell you are wearing makeup, you are wearing too much. Girls who wear a ton of makeup daily look beautiful with it on and weird with it off because you are just so used to seeing them made up. Likewise, a girl who never wears makeup looks stunning and sparkles the few times she does put some on. I personally would prefer the second one for myself. For me, I do wear makeup almost daily. I have horrible dark circles under my eyes from allergies and without concealer I look sick, tired, and sad all of the time. I don't wear makeup over my whole face, just under my eyes to lighten the circles. Every once in a while I will also throw on some light blush or mascara too, but not often. My thought are alot like both of you girls too. I am 15 and do not wear makeup. When people guess my age they generally guess a lot younger! Sometimes (for taking pictures, if I have a outbreak) I will wear a little foundation. I like wearing lip-gloss and lip color/shimmer stuff, but not alot. Thanks for another encouraging posts! Have a blessed day in Our Lord! Sometimes I wear it, and sometimes I don't. I like how it can change how people see me/ I see myself for certain occasions. I also like it because it is a little bit fancy, so when I am feeling down, sometimes I will put makeup into my morning routine just in order to pay a myself a bit of extra attention. It cheers me up and makes me feel like someone who is on top of things. Conversely, I know I am getting depressed when I stop caring about looking nice, washing my hair, and dressing well. Makeup isn't important to me, but it is fun and makes me feel like a girl. I don't wear makeup much. If I do, it is only natural Burt's Bees lip gloss or face powder (for breakouts, like others have said). I object to makeup partly because I think it makes girls look fake, and partly because of the ingredients list, which contains toxic chemicals that shouldn't be in the house, let alone on your face! My thoughts could echo those of most of the comments and Anna and Miriam's! I do not wear makeup anymore other than on special occasions when I wear a little or for theatrical performances when I have to cake it on my face! I dislike the feel of makeup, in the summer especially. It makes me hotter and I have to worry about touching my face - especially my eyes. I touch my face A LOT (which I know is bad as well). I used to wear makeup every time I went out somewhere but realized I was wearing makeup to cover up the belmishes on my face caused from wearing makeup! Since I have stopped wearing it on a regular basis (about 2 years now) my face has considerably cleared up. Now, I will say that I never had a very terrible time with breakouts and still get them occasionally but it did make a difference. Someone once told me that makeup should not be used to make you beautiful but rather to accentuate the beauty that is already there. I agree. I have seen so many young girls who "slather" themselves in makeup and actually make themselves look uglier than they would without the makeup! We need to be very careful about where we draw the line. Makeup is not a bad thing - the use of it can be a bad thing if we abuse it. We all like to look pretty but we also need to remember that God has created each of us beautiful - after all we were all made in His image! Why cover up that beauty!?! Keep up the forum girls - you're doing a good job! Well I am a little older than some of you, at 22. I wore makeup almost daily for awhile when I was 17 and 18, and I did get to where I thought I didn't look pretty without it. When I got married (at 19) My husband said he preferred me to not wear makeup, but doesn't mind if I wear it on special occasions. I figure he is the person I most want to impress, so if he likes me without it, that is good enough for me... Even when I did wear it every day it wasn't much, I don't like powder or foundation at all, it makes me break out, and I never have acne problems at all if I don't wear it, I usually just wore eye liner and mascara, and now when I put it on on occasion, it is still just that, if not just mascara. I don't have a problem with it when it is applied correctly. I can't stand to see a lady with tons of paint on her face, bright gaudy colors and caked on foundation. It just looks so un-natural. Sometimes. We camp a lot and I would never dream of bringing my makeup with me. So there are times when we are out in nature when I wear none at all. Usually on a normal day I wear powder, mascara, and light lipgloss. When my husband takes me out I also wear blush, eye shadow and liner. I wear powder to make my face not so shinny and mascara because I have light eyelashes. I want to look nice for my husband although he would probably say I don't need it cuz he is such a great guy! Thanks for sharing your views on this -I've been wondering too! I don't wear make-up on a regular basis, but since I got contacts this spring, I like to put on a little light eye shadow for church or special occasions. I might color my eyelashes with a pencil, add a little lipgloss, or put on a little powder, but I try to highlight my face rather than cover it up. All in all, I spend just a few minutes a week on make-up. I dislike heavy make-up and since I have a tendency to consider most girls fairly pretty, it bothers me when they make themselves unattractive with jungle green eye shadow or overdone mascara. I am almost 17 and do not wear makeup at all. The last time I wore any kind of makeup was at my last dance recital - when I was 9. Even when I was that young, I couldn't wait to wash the stuff off! When I was younger my mom used to wear makeup (lipstick, blush, mascarra, etc.) but now she doesn't either. I have never really been permitted to wear makeup on a regular basis, nor have I ever desired to. Actually, I do not even think we have any makeup in our hosue. Personally, I think any kind of makeup makes girls/women look very unnatural. I also think there are better things to do with my time than applying makeup, etc. I enjoy the freedom of being presentable enough to walk out the door within 30-45 minutes of waking up in the morning. Please don't misinterpret this as my trying to be superior to any of you, as that is not my intention at all, and please don't think I am a tomboy. I very much enjoy my God-given femininity, and I try to dress modestly (wearing long dresses/skirts exclusively for the past 7 years except for long bike rides, paintball games and going to bed). I just do not approve of adding to my physical appearance to make myself look "pretty." Thank you, Anna and Miriam, for this forum. I enjoy discussing topics like these, and hearing other people's views. God bless you! I've always had nice skin. But when I started wearing make-up a few months ago, I started to break out. I decided to stop, and my skin started to get better! Now I don't wear any make-up except for the occasional mascara or lip gloss. I like to look at myself and know that my face is clear and not covered with powders or creams. I hardly wear any make-up. I have a very sensitive face...and I never know what might break it out. But that said, when it is red from a food allergy, I do put on a little bit of foundation. I don't go for the eye make up or anything. Lip gloss is a something I wear every day though. I have to try to remind myself al lthe time that it isn't makeup that makes a person beautiful. It is their heart! Hi Miriam and Anna..i've been to your blog a few times and i've always felt so blessed and enriched by it! I love your site, it's perfect for young girls and older ones too..I'm one of your older readers i'm 29...i agree with a lot of you who don't like to wear make up or if you do wear it it's for special occasions. I also agree with Jody that make-up in itself is not bad, it's how much you use and how often. Anything abused is not good..i feel so sorry for girls my own age who color their hair who wear make up so much of it you can barely see their face. I haven't ever colored my hair, i just feel it's beautiful the way it is, i might get it high-lighted some day but never a different color, i'm a dirty blonde and Love my color =) i do wear nail polish sometimes but also not on a regular basis. well have a wonderful Friday and a blessed weekend! "What are your thoughts on makeup?" I agree with a lot of girls here, that makeup should be used to enhance your beauty, not cover it up! "Do you wear it or do you not?" "What are your reasons for wearing/not wearing it?" ...I'd rather not wear makeup on a day-to-day basis because I never want to feel "naked" without it. Most of my girl friends wear makeup, and have confessed to me that once they started, they couldn't leave the house without concealer, or they felt insecure, unattractive, pale... even though when *I* looked at them, they looked fine! As I said, I don't have perfect skin. I have a darker skin tone :), and I do get dark circles under my eyes pretty easily; I have acne (it isn't *awful,* but of course I notice it!)... but I don't think my self-esteem should lie in my concealer or facial creams, so I'd rather not makeup become a crutch. I agree with Anna, though -I don't see anything wrong with makeup! It's just not for me right now! Who knows how I'll feel in a year or two? I also love what Anna said about your motivations -it is all about your heart in the matter! Great post Anna. I loved this part in your post, "A clean face with the love of Christ shining through your eyes will cause you to look lovely". That's what my Mom ALWAYS taught us by. Of course now that I am older, I like to maybe where a little lip gloss and maybe some light powder just to take that "shine" away. Only occasionaly though. When you see a girl wearing blue eye shadow, heavy eye liner, mascara, and too much blush what, is the first thing that pops into your head? Wow, she is WAY too much makeup on. It is hard to see Christ shining through you eyes when too much blue eye shadow is covering them up! It's been great to read all of your thoughts, ladies! Thanks for commenting and sharing your side of the matter. I think these discussions will be a lot of fun! A lot of you have said what I agree with: if you do wear make up, it should be a little to enhance your beauty, not a lot to cover everything up. "When I was younger, my parents didn't allow me to wear makeup, so I didn't have to decide whether or not I was going to - I just knew I couldn't! As I grew older and mom told me I could start wearing it if I wanted to, I found that I really didn't want to. Not only did I not want to take the time to put it on each day, I also had seen the experiences of many other girls, and didn't want to find my beauty in powder and paint." That's almost exactly my experience too Anna! My parents didn't allow me to wear makeup (except for mucking around with my grandma's powders etc for dress-up), and once I was allowed to, I just never got into the habit. Personally while I don't think it's 'wrong' as such to wear it, I've found out about certain reasons why makeup is worn which have shocked me so much that I can't bare to wear it now! Also I don't like how girls wear it to cover up their emotional insecurity, because they want to look pretty, and be attractive through artificial means. Anna you mentioned that you don't like it because of health reasons, as it can clog up your skin etc. That is true, but I'd be more worried about the chemicals and animal products they contain, especially in lipstick/gloss. Wow my opinion is rather different. I defiantly wear less make up is the summer when I tan, but I love putting on makeup, playing with colors ect. I didn't start wearing makeup till age of 15, but I've been a lip gloss addict since the age of 13. The only time I really put on makeup during the week in on Sunday. I can usually get by with just congealer and lip gloss during weekdays. Now don't take me wrong my favorite makeup look in the "natural" look. I have habit of thinking (as judgmental as it might be) when I see a girl with noticeably to much makeup on, that there is a sense of lost innocence about them; especially when it is girls younger then myself. If a person can pull off of an absolutely natural face then bravo. You are defiantly one of the lucky few. Also I notice that in the Christian community, not nessery this blog, that they seem to condemn eye liner. Now I see how that could be the case if you use it in excess, but the same could go for lipstick or blush. Why? I agree with all of the comments on this post - that there is nothing wrong in make-up itself, but rather the over application of it, and it becoming an obsession with girls. I was once told that the more you put on outside, the less there is inside...that speaks a lot about those that you and I see walking about with heavy, caked on make-up, heavy eye shadow, heavy mascara, and the WORKS! I do wear a little make-up. I use a concealer (to cover up little blemishes), foundation powder (to even out uneven skin tone), a touch of blush, and lip-gloss. I don't really worry about the ingredients in my make-up - I usually buy mineral make-up that doesn't have harmful ingredients. I feel very grateful to have an esthetician in our church who knows about skin care and the right kind of make-up to use. Recently, I went with a friend to a cosmetics store in the mall for a consultation. I told them I wanted my make-up to look natural. They had us sit down and applied our make-up. After I was done, I was mortified at what their idea of, "natural" was! They had my eyes caked with purple eyeshadow, black mascara on my eyelashes, and tons of make-up. I was quite embarrassed and after I was done, I ran over to Macy's and washed it off in the bathroom! Of course, the applicants of the make-up didn't know any better, but I am so thankful that I was raised with the right idea of make-up and how to apply it. My parents did not allow me to wear makeup until I was 13, when they let me wear lipstick in a color of my mom's choice. By the next year, my mom had taken the time to show me how to properly apply makeup, and I could wear pretty much whatever I wanted. Like most girls, I went through a phase where I didn't want to go out of the house without makeup on, but that didn't last very long! Now, 14 years later, I still don't wear much makeup, for a couple of reasons. 1) I don't want to feel that I need to "put on my face" before people can see me. For me, wearing it all the time would be like wearing a mask so that I can hide. I don't want that. 2)Being a low maintenance kind of gal, I just don't like taking the time to do it. Nor do I like how it makes my face feel every day. I have worked jobs where makeup was expected as part of a "professional appearance" and am blessed that it is not required at my current position. Having said all that, I am glad that I have been taught how to properly apply makeup so that it looks natural, and also enjoy wearing it on occasion. The makeup that I own is a nice brand, mostly due to my sensitive skin and I throw it away when it is out of date- yes, even if there is still some left! So, I think your choices regarding makeup are between you, God, and the male authority in your life if there is one- father or husband. I appreciate the comments of the posters who said that they changed the way they wore makeup because of the views of their husband. Really, ladies- who are trying to please or impress with this? As a single woman, I only have to please the Lord, and I know that He sees me as beautiful as I am. Knowing this frees me to wear or not wear makeup, because I know that I don't have to wear it to gain attention or please others who don't matter. Thank you so much for posting this! I really enjoyed reading it. I wear makeup most of the time, though now I wish I hadn't gotten into the "habit". I've been trying to get out of the habit, opting for a more natural look. It's slow going, though. That quote about women covering up their faces was very challenging and eye-opening. Thank you for sharing. My (or "our", I should say) makeup philosophy is "When the barn needs painting, paint it." I think it's odd that parents tell their daughters that they can start wearing makeup at a certain age. If you don't need it, why use it? You should just take it one day at a time -- if you don't need makeup right now to enhance your appearance, then don't use it. I'm fifteen and I never wear makeup except for lip gloss. Neither does my seventeen-year-old sister. I don't know when we'll start using it, if ever. But, I agree with you, a little is no problem, but it grow to be an obsession if your not careful! I have worn makeup maybe twice in my whole life - the first time for a dance recital and the second for a Christmas play. Other than that I don't ever recall wearing any. I don't think it is wrong at all to wear makeup, I just don't think it's necessary. I like the more natural look. Well, I don't wear any makeup except for lip gloss on occasion(for special events). I do no think makeup is wrong unless you over do it and try to attract attention to your self. But I have no problem with accenting your natural beauty. I only wear a little bit of mascara sometimes because my eyelashs are short. I totally agree with Anna. Besides, Anna looks Great with out makeup. I think you should get some young men to give their opinions on this stuff. and my parents prefer that I don't wear anything besides a little concealer (thanks to my very dark circle genes!) I have wanted to wear more when I was younger, but am glad I haven't. I have seen christian 13 year olds with the dark make-up. Even my little bit of concealer is a hassle, and I wish I didn't have to wear it, but I don't want to look sick and exhaughsted. I am thankful that I don't have bad skin though. My dod and I talk honestly about a lot of things, and he thinks the natural look is best. And when you start wearing everything, you kind-of have to keep it up to look the same! I am sorry for my rambling. Thank you girls! I think you girls have got it about right. When I am performing under bright light I tend to wear lipstick, powder, blush, mascera--the whole nine yards--but otherwise, I either apply it lightly or not at all. I only wear makeup on Sunday morning, to business meetings and performances--also occasions like Christmas parties or places where people are taking lots of important pictures. At such occasions, I wear light blush, a little natural-shaded lipstick/gloss and the slightest touch of mascera. My eyelashes are naturally long and dark, so a lot is not necessary. My mother pointed out to me that while wearing makeup all the time simply isn't necessary or worthwhile, makeup gives a finished look that is very desirable on formal or professional occasions. As in everything concerning modesty, makeup and dress . . . keep it simple and pretty! Thank you girls. My thoughts are about the same as ya'lls. Although I'm not allowed to wear makeup yet, I won't wear much when I am allowed. I'll probably wear mascara, eye liner, and possibly a light lip gloss for special occasions. I might have a skin powder of some kind in case my skin breaks out. I don't want to get in the habit of wearing it every day. Then your hiding what God made you and making yourself something else. Ps. I like what your father said in relation to the tv show.